Corodek® is the perfect choice for many situations, especially for domestic use. From roofing & cladding, to interior use, Corodek® is suited to almost any application. 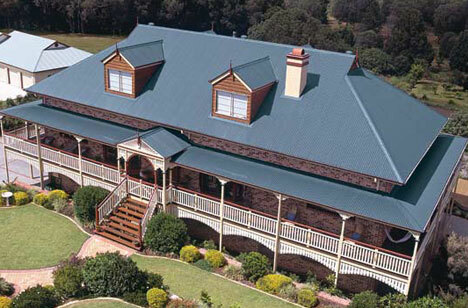 Corodek® Curving Quality is custom-length, corrugated rooﬁng manufactured from .60mm B.M.T Colorbond® and Zincalume®or Galvanised steel for long life. Soft feed G300 steel is used for curving and bending the above material. Metlok 500® is custom-length, high tensile steel roofing manufactured from .42mm, .48mm and .60mm B.M.T. Surfmist® and Zincalume®. The hidden fixing system makes it one of the most attractive options to roof, or clad any building. Combined with its minimum roof pitch, Metlok 500® is the ideal choice for large roof spans. Metlok 700® is custom-length, high tensile steel trapezoidal steel roofing manufactured from 0.42mm and 0.48mm B.M.T Colorbond® and Zincalume®. Metlok 700® has a normal cover width of 700mm and maximum length of 35 metres and is designed to lock over concealed fixing clips, which in turn are fixed to supporting members. It is manufactured by continuous roll form method and is ideal for use on new and renovating domestic and commercial/industrial applications. The Metrib® cladding profile comes in Zincalume® steel and a wide variety of Colorbond® steel colours. It can be applied to internal as well as external structures but it requires underlying infrastructure. The longitudinal flutes provide rigidity along the length of the sheet whilst retaining full flexibility across the width. Metroclad® 850 is a low rib height, custom length, high tensile steel wall cladding manufactured from .35mm and .42 B.M.T. Colorbond® and Zincalume®. Metroclad® 850 is ideal for wall cladding on rural, commercial and domestic applications. Metroll can supply Metroclad® 850 Colorbond® or Zincalume® sheeting up to a maximum length of 6 metres. Longer lengths may be possible to be supplied, subject to arrangement. Lengths ordered to be manufactured by Metroll must be site measurements, not those taken off plans. Metrospan® is a versatile roofing and cladding profile that is aesthetically pleasing product, it is ideal for almost any use. Metrospan® is a roll formed, custom-length, high tensile steel uniformly profiled roofing and wall sheeting material, manufactured from .42mm and .48mm B.M.T. 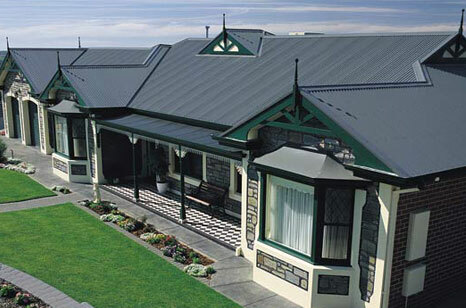 Colorbond® and Zincalume® or Galvanised® steel. Metrospan® is ideal for roofing and wall cladding on commercial and industrial buildings, roofing for new homes, home extensions, carports, garages, covered patios, fencing, fascia and facade work. A small ribbed version of Corodek®, Mini Corodek® is well suited to cladding of all types of buildings, as well as for use as a superior interior finish. An elegant profile in a traditional style, Mini Corodek® is a sophisticated corrugated profile from Metroll which is suitable for use in exterior and interior applications on straight or curved surfaces. Requiring a pitch of only 2°, Trimclad® has the answer for longer spans. Used to Clad and Roof industrial buildings, homes, carports or patios.Trimclad® is custom-length, high tensile steel roofing manufactured from .42mm and .48mm B.M.T. Colorbond® and Zincalume® or Galvanized® steel. It is also available as a wall cladding manufactured from .35mm B.M.T. Colorbond® and Zincalume® steel. 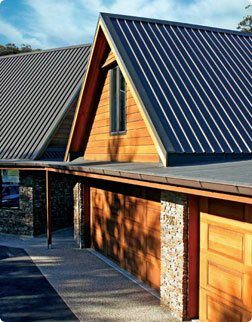 Trimclad® is the most popular industrial roofing and cladding profile. It is also excellent for all residential uses.